At the ordinary meeting held in 2015, the respective conferences of the parties to the Basel, Rotterdam and Stockholm (BRS) conventions decided to review the synergies arrangements at their meetings in 2017 (BC-12/20, RC-7/10 and SC-7/28). 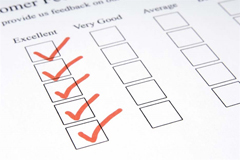 With the objective to gather data to inform this review process, e-surveys have been dispatched to all stakeholders. The e-surveys can also be accessed via the hyperlinks below. Please click here to access the e-survey for parties. The submission deadline is 5 August 2016. Please click here to access the e-survey for BCRCs and SCRCs. The submission deadline is 22 July 2016. Please click here to access the e-survey for FAO country offices. The submission deadline is 22 July 2016. Please click here to access the e-survey for partners. The submission deadline is 22 July 2016. Please click here to access the e-survey for Secretariat staff. The submission deadline is 22 July 2016.